13.11.2017 | Los Angeles, California, USA — XBIZ is pleased to announce the finalist nominees for the the 2018 XBIZ Exec Awards. The annual awards program honors top industry leaders who play key roles in the success of their prominent brands and celebrates their exceptional career achievements. Industry members nominated peers for prestigious award categories, which cover a range of occupations that make up the organizational chart of industry enterprises, covering business development, marketing, management, chief executives and more. 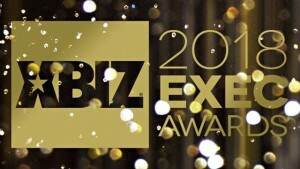 The XBIZ Exec Awards will be presented at an exclusive awards ceremony during the XBIZ 2018 events series. Women In Adult also will present its annual WIA award at the XBIZ Exec Awards. XBIZ 2018 runs Jan. 15-19 at the Andaz hotel in West Hollywood, California, USA. Voting for the 2018 XBIZ Exec Awards on XBIZ.net will run through midnight on Tuesday, Nov. 14. To view the list of nominees for the online industry edition of the 2018 XBIZ Exec Awards, click here. To view the list of nominees for the retail industry edition of the 2018 XBIZ Exec Awards, click here.